On pre-release day I just wanted to jot down a few notes about the development and craft of this game. Structurally, the game might be what Sam Kabo Ashwell called a Sorting Hat game (https://heterogenoustasks.wordpress.com/2015/01/26/standard-patterns-in-choice-b...), with three main branches and 7 possible endings. Granted, many of these endings are pretty close to each other. Replaying and hitting all three major branches is highly encouraged. Writing this in multiple 3rd person POVs--with a narrative structure bordering on the omniscient--definitely kept me on my toes. Although I'd say that 90% of the story was either in Astrid's or the bathroom's voice (with the former taking up the lioness' share between the two), keeping it omniscient helped ground the entire fabric of the story in the mythic. The narrative turns aren't "unreliable" in the traditional sense--far from it--but it allowed the voice to jump leaps and bounds into another strand of the story, perhaps mimicking the way Twine itself works. I explored some of the ideas about choice and complicity in my 2015 IFComp game Unbeknown, but (being in a time crunch at the time), I don't think those narrative keystones were well signaled for the player. With A Bathroom Myth, and its sort of-omniscient POV, I've felt a lot more freedom to pretend the fourth wall isn't there. Sometimes the nameless narrator talks to the player (although these are usually gentle asides) and on occasion different characters interact with the player. Why did I do that? Well, state-tracking is actually pretty minimal here, so it was important for me to signal to the player that a choice not might be "important" here in the traditional, gamist sense, but it still matters. Perhaps in a different way than what you were expecting. And hopefully in a way that still felt satisfying and moved the story forward even when, at the outset, it might look like things are standing still. For example, there are a several places where the choice is more about the story rather than a character, nudging the player toward "what happened here" in a broader sense. These characters are still mostly driven by character but the player's "agency" isn't directly embedded inside the character's actions. Of course, many of these choices are inherently political and personal, and the player will decide how the two intersect "in the street" (or a public restroom). They sometimes involve how much a character wants to risk--not always in a physical sense. Trans women are constantly having to negotiate this risk. As a trans woman, I wanted to write certain topics that I often don't see in games--or other forms of culture, for that matter. Topics that aren't purely about "empowerment" (though empowerment is important too!). 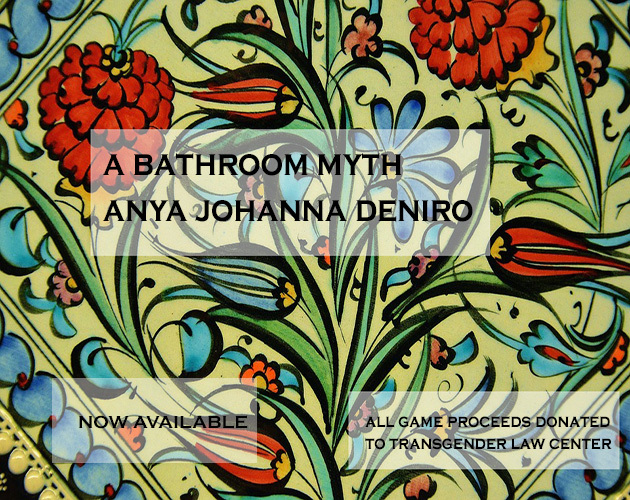 And of course I tried to dovetail with game content with the fact that it's a game that will hopefully raise some money for the Transgender Law Center. And yeah. I just don't do realism really well. I would rather use myth and folklore as a lens to look at things that are part of the everyday fabric of many trans women's lives. And in some cases, driving the point home using fantasy tropes. "Stealth," for example, is such a tricky, complicated concept that can't be talked about without also acknowledging the layers of privilege that come with it. While it isn't a game mechanic per se, there is a point where a trans woman character can try to use stealth in a conscious, highly stylized way. I don't want it to be reductive, though, or a strict allegory in which various aspects of a transgender person's life are literally building blocks or stand-ins for game mechanisms. This is a game made entirely of words, after all, and that means--at least for me--there are going to be pieces that don't strictly "fit together", but hopefully point toward something better and richer. In that sense, I think the game is inherently hopeful. Next post hopefully I'm going to write a bit more about the villains, the Edict itself, and the animals and their countless bureaucracies.